The Tennessee River Valley is known for its many rivers, recreational lakes and waterways that stretch across the region connecting communities and larger metro areas. It is never hard to find a location to experience the river. Each year, millions of visitors are drawn to the promise of miles of whitewater paddling, tranquil flatwater and the lure of kayak fishing. Exploring the Tennessee River Valley by water is easier than ever. The Tennessee River Valley mapguide serves as an excellent planning guide to help travelers navigate their trip. The Tennessee River and its seventy plus tributaries are widely known for the quality of paddling experiences and for the diversity of the shorelines, from vibrant cityscapes to densely tree canopied streambeds. The mighty river begins upstream of Knoxville, Tenn. The river flows 652 miles south then west across northern Alabama and a small portion of northern Mississippi before turning north to Kentucky where the river discharges into the Ohio River only miles upstream from the Mississippi River. The Tennessee River is also part of the 6,000 mile Great Loop, a system of waterways that traverses the eastern portion of the United States and part of Canada including the Great Lakes, the Rideau Canal, and the Mississippi and Tennessee-Tombigbee Waterway. The waters of the Chattooga, Pigeon, Ocoee, Toccoa, Nolichucky and Obed Wild and Scenic River are known for adrenalin pumping adventures where the roar of water and swirling eddies add to the experience. Equally fun are the stretches of flat-water rivers or the impounded waters behind the dams, which provide miles of waters to kayak, canoe and stand up paddle, boarding. Now that summer is in full swing, the Tennessee River Valley has compiled a list of popular outfitters and waters to give to those who are in search of some paddling fun. Wildwater, the oldest outfitter in the Southeast, offers both beginning and intermediate whitewater river trips. 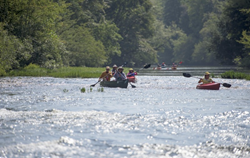 Paddlers can experience exciting whitewater on the Pigeon River. For those in search of a big adventure, the wild and scenic Chattooga with its steep drops through a wild gorge, or the dramatic and exciting class III and IV waves of the Ocoee do not disappoint. If calmer waters are more desirable, Wildwater offers family-friendly fun with lots of splashy waves on the Nantahala and Pigeon River trips. Rated among some of the cleanest recreational waters in the South, the Bear Creek Lakes in northwestern Alabama are popular for all kinds of water recreation activities especially canoeing and kayaking. The Bear Creek Floatway, which flows into Bear Creek Reservoir, is a popular spot for teaching first-timers to negotiate rapids and work with the current. Releases from Upper Bear Creek Lake provide adequate flow on weekends and holidays from Memorial Day through Labor Day. The 24 mile floatway is considered a Class I course except for Upper and Lower Factory Falls which are Class VI rapids and are very dangerous – only the most experienced paddler should attempt; portaging is available for all others. Along with fun on the water, the Floatway offers scenic gorges, flatland forests, waterfalls, bluffs and a wide diversity in vegetation. Below Bear Creek Dam the Lower Bear Creek Canoe Trail provides a more leisurely float, running 34 miles downstream to Pickwick Dam on the Tennessee River. The Alabama Scenic River Trail is the only blueway that has it all—from mountain streams to river delta to the salty waves of the Gulf of Mexico. Paddling and powerboat experiences and exploration abound along nearly 5,000 miles of accessible waterways on over 43 waterways with over 40 outfitters and adventure services to serve and assist. Plenty of amenities and campsites to support everything from long-distance touring to organized paddles to races, overnight trips or any kind of day trip are available. The Alabama River, Coosa River, Tensaw River, Tennessee River, Cahaba River, and other Alabama rivers, the Mobile-Tensaw Delta; and Terrapin and Hatchett and Weogufka Creeks comprise the main waterways of the trail. They offer access to big cities and small towns. Just a short drive from Chattanooga, Nashville, Knoxville and Atlanta, the Ocoee River has entertained and provided whitewater rafting adventures for millions of visitors over the years. The Ocoee River is great for beginners and advanced whitewater adventurers. Longtime experienced outfitter, Ocoee Outdoors guides outdoor enthusiasts through almost continuous class III, IV, and V whitewater excitement from beginning to end. Not only will the experienced guides help visitors navigate the turbulent rapids, they will also throw in an educational lesson about the history of the Ocoee and the beautiful area surrounding the river. Half day and full day adventures are offered. The half-day adventure makes it way down the Middle Ocoee and is for ages 12 years old and up. This experience includes two hours on the water, with total trip time approximately four hours. With the full day adventure, spend approximately six hours conquering the Middle Ocoee and the Upper Ocoee of Tennessee, the site of Atlanta’s 1996 Summer Olympics whitewater events. The adventure begins with the upper section of the Ocoee River and ends with the classic middle. This experience includes four hours on the water and a riverside lunch. The Hiwassee is one of the most beautiful rivers in the South and is designated as a Tennessee State Scenic River. The Class I and II whitewater is great for a family raft float or trying out a funyak. This experience offered by Ocoee Outdoors includes two hours on the water, with total trip time approximately four hours. Buffalo River Resort features hiking, tubing, kayaking, canoeing, horseback riding and other fun right on the river. Canoes, kayaks and inner tubes are available to rent and trips down the picturesque Buffalo River range from five miles to eight miles. A 25-mile overnight float is also available for a more extreme quick getaway. Not named for buffalo that roam across the prairie, the flowing river is named for the Buffalo fish, which was abundant when the first European settlers arrived. Located on the beautiful Indian Creek in Olive Hill, Tenn., Up the Creek offers a short two and one-half hour and a long six to eight hour trip for those in search of clear water, the beautiful Tennessee scenery and wildlife. Up the Creek is typically open from May to September. In addition to canoes and kayaks, Up the Creek offers cabin rental and tent sites for those floating the creek. “Exploring the Tennessee River Valley by water is easier than ever. The Tennessee River Valley mapguide serves as an excellent planning guide to help travelers navigate their trip,” said Julie Graham, spokesperson for the Tennessee River Valley Stewardship Council. Along with these water adventures, the Tennessee River Valley offers a compelling story, captivating visitors with its little unknown facts, pristine, untouched areas and rich, authentic experiences. Save trip ideas and plan a trip easily with the Tennessee River Valley Geotourism MapGuide, an online guide to explore authentic places and adventures that have been recommended by locals.